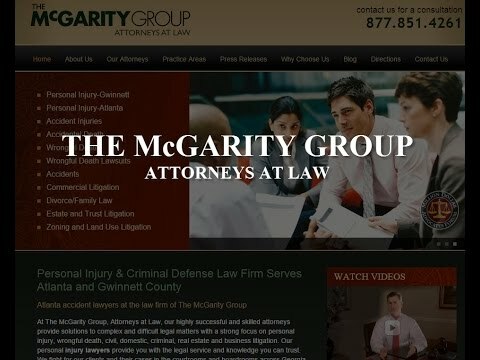 The attorneys at McGarity and Efstration have represented hundreds of brain injury victims in Georgia. We provide the compassion and determination you and your family need during this difficult time. Whether your brain injury is mild or severe, you have the right to seek compensation for your damages from the negligent party. Our experienced legal team walks you through the process step by step and strives to obtain a significant monetary award that helps you move forward with your life. Temporal lobe injury. The temporal lobes of the brain are on the bottom and at the side of each of the two hemispheres. This area of the brain is responsible for the primary organization of sensory input. When damage occurs to these areas of the brain, patients may experience disturbance of auditory sensations and perceptions, an inability to pay attention to what they see or hear, impaired ability to comprehend language, seizures and various other symptoms. Occipital lobe injury. The occipital lobes are at the back of the brain and are responsible for visual perception. Damage to them results in loss of visual capability, an inability to identify colors and hallucinations. In severe cases, patients may experience severe vision loss or total blindness. Frontal lobe injury. The frontal lobe is at the front of each cerebral hemisphere. This lobe is responsible for conscious thought, voluntary movement and individual personality characteristics. Damage to this vital lobe can cause impairments in judgment and reduce someone’s motivation and attention span. A person suffering from a frontal lobe injury may also become impulsive, act rashly or adopt risky behaviors. Parietal lobe injury. The parietal lobe is at the back of the head under the skull bone. It assists in the processing of visual images and other sensory input. If damage is sustained to the parietal lobe, the individual most likely has difficulty reading, recognizing people and objects, and having a comprehensive awareness of his or her own body. When head injuries occur, it is essential to seek medical assistance to determine if your brain has sustained harm. If your injuries are the result of another person’s negligent, risky or willful behavior, seeking legal help from experienced Atlanta personal injury attorneys is in your best interests. Generalized seizure. Generalized seizures appear to start in all parts of the brain simultaneously and have no identifiable onset. Many generalized seizures start and spread so quickly it is impossible to identify the source. If the source of a seizure is unidentifiable, surgery is not available as a treatment option. Partial seizure. Partial seizures refer to seizures beginning in one area of the brain. By observing which area of the body is affected by the seizure, physicians can identify where in the brain the seizure occurred. Partial seizures are usually treated with medication or, in some cases, surgery. If you or a loved one has been involved in an accident resulting in a brain injury, contact McGarity and Efstration to discuss your legal options. We can be reached at 877.851.4261 or online.